One thing the real estate industry has not done the consumer any favors with is vocabulary. You have a lot to pack up when you move and there are A LOT of words that get tossed around when you buy or sell a home. This is no Betty Crocker recipe (sorry, you can’t “just add water”) and it’s definitely not as easy as 1-2-3. Straight from the Jovio Neighborhood experts, here are some real estate ABC's to be in the know about. And, yes, we might have taken some liberties with the A-Z route. 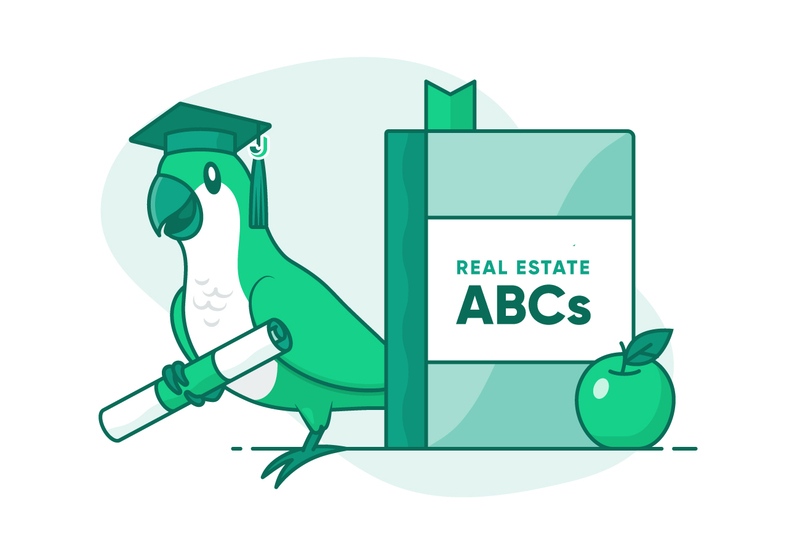 While these ABC’s probably wouldn’t have gotten us past second grade, we're confident they will educate you on real estate! Appraisal: An estimate of value. This is performed by a licensed Appraiser with state authority. Appraisals are often used when the buyer of a property is obtaining financing. Though, sellers can request one as well. Broker: The broker is a licensed individual who facilitates a transaction. They represent the interests of the Principal (maybe that’s you!). They also assist in negotiating contracts. They’ll likely charge a commission or fee–remember to do your research before you dive in with one! Commission Fees: The definitely not-so-fun part of real estate. These are the fees any agent or broker charges upon the sale of a home. Escrow Officer: The Escrow Officer is a trusted neutral stakeholder in the transaction process. This person will hold and disburse funds and proceed under the terms and conditions of the purchase contract. Fiduciary Duty: It’s an agent’s fiduciary duty to put the interest of their client ahead of anything else. The agent must provide their service as a “CARLOAD”–Confidentiality, Accountability, Reasonable Care, Loyalty, Obedience, Advise, Disclosure. ListinG: Yep, this ENDS with G. Still important though! This is what happens when your house is for sale. It becomes a listing and will be found on MLS sites (more on that below). HELOC: Stands for Home Equity Line of Credit. This is a way to use the equity of your property for purchases as a line of credit. Intermediary: This individual will represent–in a limited way–both sides of the party in a transaction. Their main goal is to provide facts rather than advice. AdJustable Rate Mortgage (ARM): Stretch out YOUR arms while we take a bit of a stretch on the “J" here. The ARM maintains a fixed rate for a set period of time, sometimes between 3 and 10 years, then it adjusts as often as every year thereafter. If you’re planning to sell within that set time frame, ARMs may be perfect for you. Lease-bacK: Well, the K being the focus here works out fine! Lease-backs will happen at the end of a transaction. It’s when the buyer or seller is leasing the property after the close of a deal. FLat Fee: Some agents and brokers charge percent-based commission fees to help sell your home. This is regardless of the amount of effort they put in to actually sell. The Jovio Way is similar to a flat fee. You pay $4,490 (a minimum listing fee of $3,995 plus a $495 setup fee), or about 1%, and we do it ALL to sell your home. MLS (Multiple Listing Service): This is the method that agents use to market a property. Think of this as an exclusive “REALTORS® Only” Zillow. The MLS is a very important piece to the selling process. Only REALTORS® who are members of a particular board of REALTORS® have access to the MLS. When a property goes live, all REALTORS® will receive a notification if that property matches their buyer’s criteria. The MLS ensures no oversights. Make sure your agent has access to the proper MLS for your locale. Negotiations: We’re sure you know what it means to negotiate. Real estate negotiating is way more complex than the negotiation with your significant other on dinner plans (or perhaps not? Who are we to judge…). There are lots of negotiations involved from start to finish when you buy or sell. The contract sale price is the first of many negotiations. Be as prepared as possible and make sure you have a trusted advisor on your side (may we suggest a Jovio neighborhood expert…hint hint). Option period: Buyers, this is where you have the control! The option period is a set time frame where the buyer can cancel the contract for any reason. During this period, the buyer’s representative and the buyer complete their due diligence on the property (there is consideration given for the right to complete this–typically a couple hundred dollars). Pre-listing: This is when a property is in preparations to be listed. At Jovio, the pre-listing period includes ramping up marketing efforts. This ensures that we get more eyes on your home. EQuity: A fancy word for MONEY YOU KEEP when you sell a property. In more formal terms, equity is your home's Market Value or Sale Price minus the Mortgage Balance and other sales expenses. REALTOR®: This is a term designated for membership in a professional group. You can only become a REALTOR® if you join at the national, state, and local level. It’s important to note that there IS a difference between REALTORS® and Real Estate Agents. FSBO: For Sale By Owner, though this is often pronounced FIZBO (yes, like the clown that Cam dresses up as on Modern Family). No, Fizbo the Clown is not selling your neighbor’s house when they say “we’re selling our house FSBO.” It means the sellers have chosen to do it alone–there's no agent involved. Side note: There are sharks (and even some clowns) in those waters. Approach with caution. Temporarily Off-Market: This happens when a seller instructs their agent or broker to halt marketing efforts for a bit. Why would one ever do this? Maybe because Santa’s coming and you’d like him to visit your home’s chimney one last time. The holidays are a BIG reason to go off the market temporarily. Or perhaps those once tiny holes in the wall now seem bigger and you need to make repairs. The point is that going temporarily off-market makes it so that your property does not add unnecessary days on the market. Underwriting: A process when a loan goes through approval based on a certain set of lender requirements. The buyer and property must meet the lender’s predetermined guidelines to be approved. Automated Valuation Models: A regression model that establishes the market value of a property. AVMs will take into account certain dependent variables. Automation is important for speed, but human-power behind the model is what gives it real MoJo. AVMs are good, but there's nothing like hands-on knowledge–have a Jovio neighborhood expert verify any AVM data. Walk-through: This will occur when the buyer is visiting the property before closing. It's the process of verifying that all areas of the property are in acceptable condition, usually prior to meeting with the Escrow Officer. Once the walk-through happens without issues, the buyer can close and take possession. 1031 Tax EXchange: (Two x’s on this one… Do we get bonus points?!) Stick with us here–a 1031 Tax Exchange is a way for an investor to buy a property and defer capital gains. It’s basically the swap of one business asset for another. The main thing to remember is “like” property, whether it’s vacant land, a rental property, a commercial building, etc. There have been some recent changes to this loophole so consulting a trusted tax advisor is suggested! ContingencY Offer: This means that the offer is conditional upon meeting another need. One example could be that the buyer must sell their current property before they can purchase the subject property. AmortiZation Schedule: A way to make equal payments on a loan over time. The schedule separates each payment out. In the beginning, you’re paying mostly interest; in the end, you’re mostly reducing the principal with very little applied to interest. While the allocation toward principal and interest changes in every payment, the total amount of the payment remains constant throughout the term of the loan. So, there you have it. Your ABCs of real estate. Well, these are SOME of the words you’ll need to know, so study up–quiz tomorrow! (Kidding… maybe.) In reality, the world of real estate can be intimidating. Whether you’re an experienced seller or total newbie to the scene, know some lingo before you go. Parting words: Watch out for those Cs and Fs (Commission Fees and FSBOs)–they might look easy to get through, but in the end, they can become tongue twisters (or worse). Now you know your ABCs! Please note that this information is being provided in a fireside chat style format. The use of this not intended for official legal advice.